Landslides are one of the most catastrophic geo-hazard all over the world. The study of this phenomenon is hampered many difficulties due to the complexity of the instabilities, the loose of data and the important variability of its causes. Geomorphological mapping of landslide susceptibility is a method that relies to the ability of the investigator to actual and potential slope failure according landslide inventory. 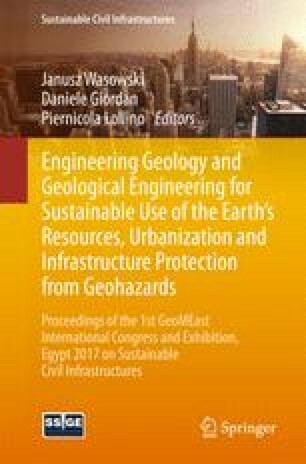 The landslide susceptibility and hazard assessment approaches need a good knowledge of the previous observed scenarios and include collecting data, construction of spatial database as well as spatial and statistical analyses. Every year, principally in winter, the North of Algeria is affected by instabilities of greater magnitude causing equipment damage and important costs. This research is focused on the study of Tizi-Ouzou region, located at about 90 km east of Algiers, Algeria. Tizi-Ouzou is a region of Kabylia, with an area of 3568 km2, characterized by a mountainous morphology. This region is characterized by about 84 significant instabilities affecting urban areas. The work aims to make, in the first hand, a spatial and statistical study of instability causes and site sensibility parameters, and in the second hand, the susceptibility assessment and mapping of Tizi-Ouzou region according to the landslide inventory effectuated in this region. The study indicates that the main instability factor is water effect and lets the proposal of Tizi-Ouzou region susceptibility map.